A Pineapple Express is a non-technical term used to describe a weather pattern that originates in the tropical Pacific and impacts the west coast of the United States. More specifically, it is a type of atmospheric river. According to NOAA’s Earth System Research Laboratory, atmospheric rivers are “relatively narrow regions in the atmosphere that are responsible for most of the horizontal transport of water vapor outside of the tropics.” Coming in a variety of shapes and sizes around the globe, they form when strong winds associated with storms draw moisture into a thin area ahead of a cold front. The strongest atmospheric rivers can carry as much as 15 times the amount of water that flows through the mouth of the Mississippi River. Directed by the jet stream, a Pineapple Express transports moisture from the Hawaiian tropics to the west coast of the US. They are famous for bringing warm, moist air and heavy rain to California, Oregon, and Washington. Just a few of these events, according to NOAA, can supply the region with 30% to 50% of its annual precipitation. While beneficial on one hand, they can also be dangerous. If these systems stall over an area, they can cause major flooding and landslides. The term Pineapple Express is named for the tropical Pacific’s popular fruit. The atmospheric river known as the pineapple express. Image credit: cimss/wunderground. Clouds are visual indicators of what is going on in the atmosphere. They are also aesthetically interesting. Mammatus clouds are one of the more striking sights in the sky. Technically, they are a supplementary feature of a variety of other large clouds. However, they are most dramatic when they line the underside of a cumulonimbus. Shaped like giant udders, they form when parts of the anvil cool and sink into warmer air. In general, the more plump the udders, the more severe the recent or nearby thunderstorm. 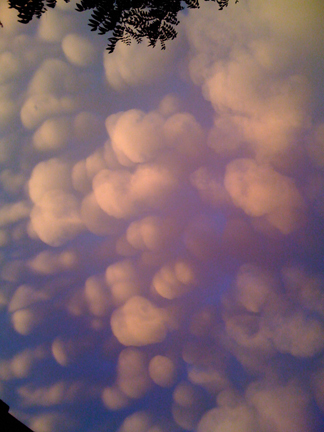 Below is a photo of the remnants of the first Mammatus cloud I ever saw in person. It was taken in New York City shortly after a violent summer thunderstorm a few years ago. Generated by severe thunderstorm activity, tornadoes are nature’s most violent storms. Scientists do not know exactly what causes them, but atmospheric instability and wind shear are important contributing factors. Instability in the atmosphere is created when a warm, humid air mass meets a cool, dry air mass. Through the process of convection, this encounter allows warm air to rise easily and produce thunderstorms. The greater the instability, the stronger a thunderstorm can become. Wind shear occurs when there is a localized change of wind speed and direction. When surface winds blow in one direction and upper level winds in another, the air in-between is set in a horizontal rolling motion. The updraft of the thunderstorm can then tilt the rotating air into a vertical position. When that vortex extends from the cumulonimbus cloud to the ground, a tornado is born. Tornadoes can occur anywhere in any season, but are more typical in the spring and summer months in the United States. 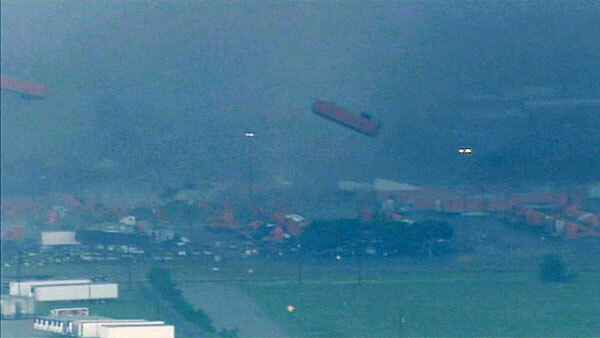 According to NOAA, approximately 1,200 tornadoes touch down in this country every year. Severe weather can happen anytime of the year, given the proper conditions. This past weekend, for example, unstable air and wind shear combined to send tornadoes roaring through America’s heartland. Any meteorological event that can cause property damage and loss of life is categorized as severe. It can come in a variety of forms, depending on location and season. High winds, strong thunderstorms, tornadoes, wildfires, dust storms, hurricanes, floods, and blizzards are all examples of severe weather that occurs in the United States. When any severe weather event is in the forecast, it is important to understand the difference between the various alerts issued by the National Weather Service. They include advisories, watches, and warnings. All should be taken seriously. Advisory: An “advisory” is issued when significant, but not severe, weather conditions are likely to occur. Residents should exercise caution. Watch: A “watch” is issued when dangerous weather conditions are possible over the next several hours. They generally cover a large geographic area. Residents should be prepared to take action. Warning: A “warning” is issued when dangerous weather is imminent or already occurring. They cover a smaller, more specific geographic area. Residents should take action immediately. Record Warm March for the U.S.
Spring heat dominated the weather pattern across this country last month. 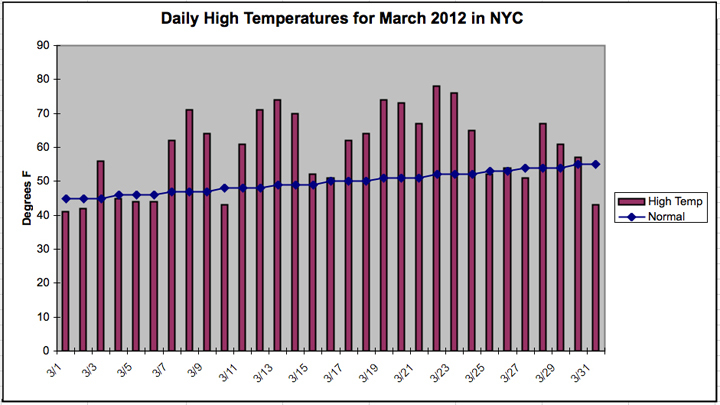 Locally in NYC, March 2012 was our second warmest March on record. Nationally, it was the warmest March ever for the contiguous United States. As a whole, the country registered an average temperature of 51.1°F, which is 8.6°F above the 20th century average for the month. According to the NOAA report released this week, every state in the lower forty-eight experienced at least one record warm day. A total of 15,272 daily high temperature records were broken. Scientists say the same reasons that caused this year’s record warm winter brought us an unusually mild March. They include La Nina, the North Atlantic Oscillation, and their influence on the position of the Jet Stream. NOAA is forecasting a continuation of this warm trend, especially in the eastern and southern parts of the country. Wildfires are usually associated with the American West. This week, however, they dotted the east coast from Florida to Massachusetts. Unusually dry conditions and strong winds fueled their development. Here in New York City, a five-alarm brush fire broke out in the composting facility of the former Fresh Kills Landfill on Staten Island. Winds between 15 and 20 mph fanned the flames and sent thick clouds of smoke across the highway, snarling traffic. Another large wildfire blazed on nearby Long Island. It charred over one thousand acres of land destroying nine commercial buildings and three homes. Fortunately, no deaths have been reported. April is a month famous for its showers. This year in New York City, however, they have been few and far between. In fact, the city has received below average precipitation for the past three consecutive months. This has left us with a rain deficit of 5.66 inches. As a result, the local underbrush has been transformed into a tinderbox just waiting for a spark. Officials say the flames of the current wildfires are still smoldering, but are mostly contained at this point. However, until the winds subside and significant rainfall arrives, wildfires will remain a serious threat in the eastern United States. Record-breaking March temperatures were seen in many parts of the United States this year. Here in New York City, it was our second warmest March on record with an average temperature of 50.9°F. That is 8°F above normal. We missed the all time record high from 1945 by only 0.2F°. In terms of precipitation, the city entered record territory again. After receiving only a meager 0.96 inches of rain, which is 3.4 inches below normal, this month became our fourth driest March on record. Snowfall was also conspicuously absent this month. On average, the city usually accumulates 3.6 inches of snow in March. This year, however, there was none. March 2012 marks the third consecutive month that the city has seen both above average temperatures and below average precipitation.